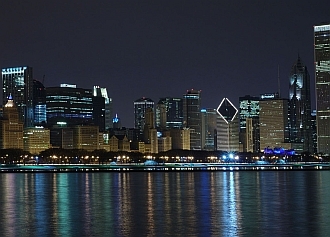 That's the Chicago skyline, for those of you who don't live around here. I post it because we have a great Affordable and Interesting collection of short stories today ... all about Chicago noir. That's even the title! Chicago Noir! As the back says, "These stories tell of a Chicago beyond Oprah, Michael Jordan, and deep-dish pizza." Each story is associated with a certain Chicago cross-street, too. Ah, John Dillinger. Never has another criminal captured my heart so ... or in fact the entire nation's. Dillinger was a Depression-era bank robber. 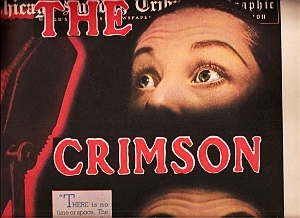 He was eventually betrayed by his landlady, who was called "The Woman in Red", and shot in a North Side alley. But he was well-loved! Movies have been made (including one with Johnny Depp), and while looking for Dillinger pages that I could link you to, I discovered that there is an upcoming Chicago event on July 22 that will be hosted by the John Dillinger Died For You Society. Ladies in red get in half price. 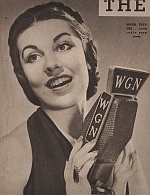 The first season ran twelve weeks and starred Hugh Studebaker, one of Chicago's radio soap opera veterans as the lead. Maida Travers played by Donna Reade was a vocalist whose singing inspired Quill to give purpose to his life. Born a frightful hunchback, Peter Quill never ventured outside his laboratory. His discovery of invisible lightning involved him in a plot against The Red Circle to recover stolen battleship plans. ... The story begins in Washington, DC with the theft of the plans. The action moves to New York and the Jersey Coast, then across the Atlantic to the British Isles. The final showdown occurs in the Mediterranean Sea with a treasonous Peter Quill on a Red Fleet battleship. How did he get there? Was he a traitor? This was all a clever ruse to deceive The Red Circle who wanted him to use his invisible lightning against the free world. Oh, for the days when ladies smiled so fakely. This 1916 tome contains an enormous amount of analysis on a topic that I personally have never before thought to consider. As the author notes, "We find no trace in Shakespeare's works of any belief in the many quaint and curious superstitions current in his day regarding the talismanic or curative virtues of precious stones. This is quite in keeping with the thoroughly sane outlook upon life that constituted the strong foundation of his incomparable mind." That's good to know. 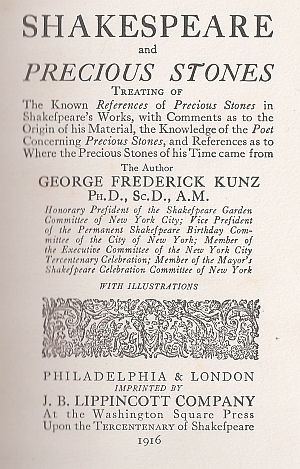 Note that the author, George Frederick Kunz, dedicated the book to his daughter Ruby. The author has also inscribed this copy of the book to a friend; so our copy is signed, and yet it is still the cheapest copy on the market at $150.00. Red is my favorite color! Maybe I should theme every blog entry after a color. Except I'll be bored now that I've already done red. Oh well. Something to think about for the future, certainly!